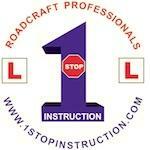 I have just passed my Direct Access with One Stop. It was an intensive course, but very informative and rewarding. The teachers are excellent, very motivated and try hard to improve your skills quickly in a short period of time. Instructions on what to expect from the Mod 1 & 2 tests were very insightful and covered all aspect you may encounter on the day. Delighted to pass first time and celebrating tonight! !